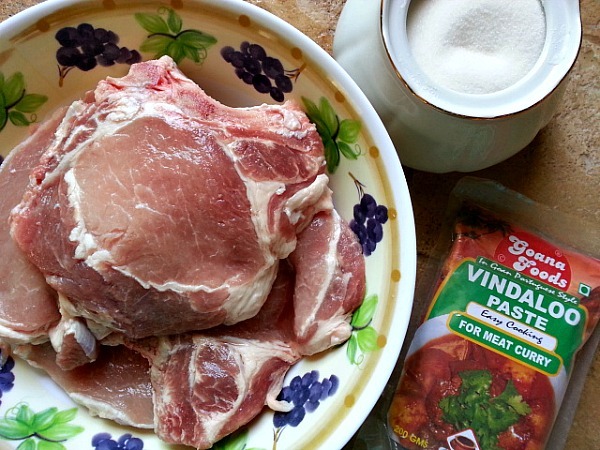 For a Goan who loves vindaloo masala this was a spot-on for the classic pork chop recipe. 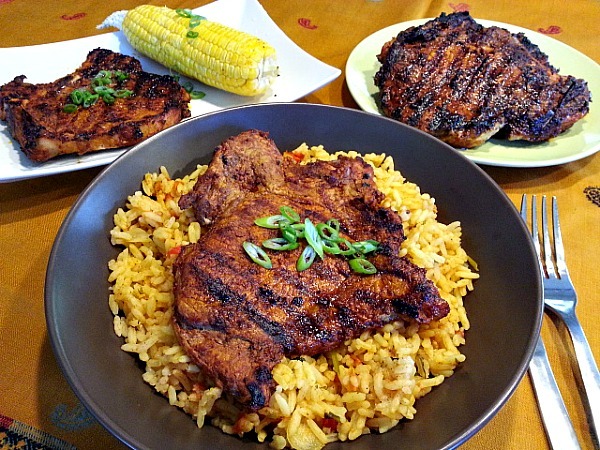 It has the classic combo of sweet and sour that goes with a American pork chop recipe. The sweetness comes from a dash of sugar and the sourness comes from the coconut vinegar added to the marinade. 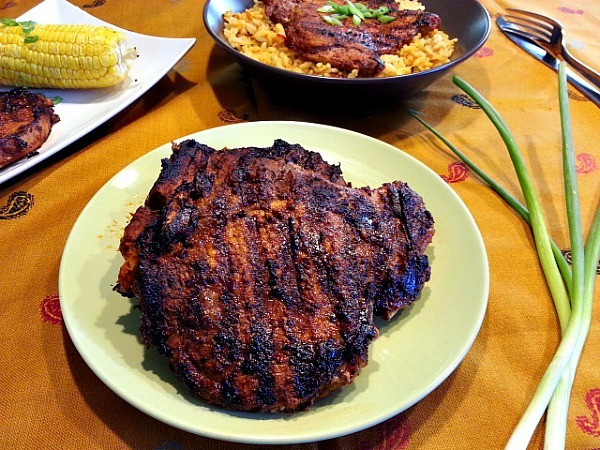 The pork chops were the stars for our 4th of July weekend. I used the leftover pork chop the next day for my salad and it definitely did not disappoint. Wash the pork chops, dry it with paper towel. Mix vindaloo paste, sugar and salt to taste in a bowl or zip-lock bag. Apply and let marinate in the refrigerator for at least 30 to 45 minutes. If possible the day before is the best. 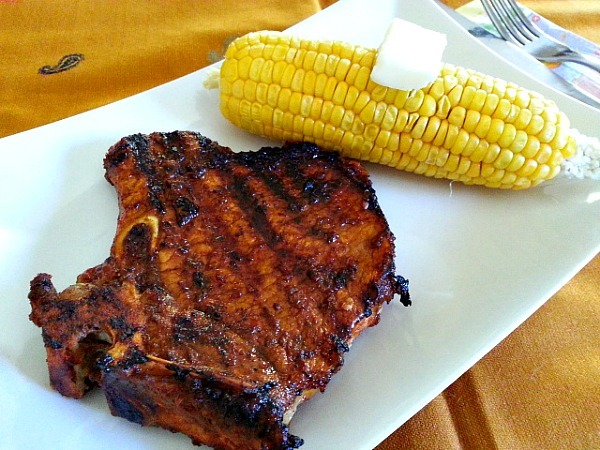 On a hot grill lay the pork chops and cook till done according to your preference. Since I like my pork chops well done I grilled mine on a Cuisinart 5-in-1 Griddler Gourmet for 8-9 minutes on each side on high setting. The sugar in the marinade gives a nice charred mark on the meat which I very much like. Serve as a side with rice or salad or as the main with some cooked green beans with grated coconut. For the first time an Exclusive Coupon Code ” goanwiki711 ” that you can use @ www.goanimports.com on the Goan Spices Fiesta Combo Pack within the next 30 days. This looks absolutely delicious; will have to give the recipe a try! They are :-). Made them again for lunch yesterday. I barely eat pork but this looks amazing! Wow! I love Indian vindaloo dishes… is this similar? Sounds SO GOOD! Wow! This looks absolutely fantastic!!!! These look delicious. I find pork boring except when it’s been marinated and then I absolutely love it. Thanks Much Radhika 🙂 You sure can use it for chicken and it should taste just as delicious as the original recipes. 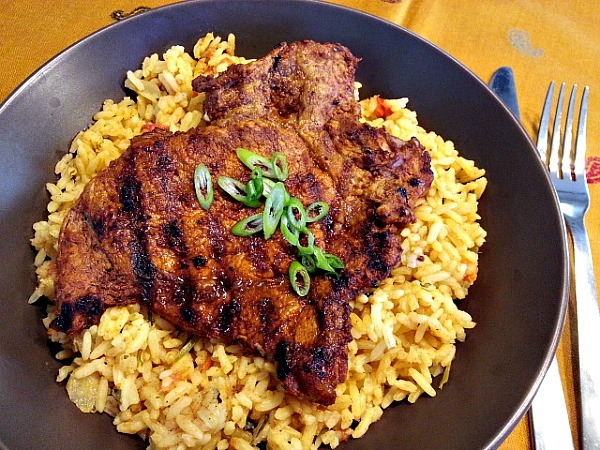 Nandini,, these chops look so flavorful and I love the vindaloo preparation in Indian restaurants; I also happen to have coconut vinegar and my husband loves pork chops, so this is sure to be cooked here soon!